Sitting on a plane bound for Rome as the funeral fast approached, and with only sketchy plans of what to do next, I knew one thing—I had to be there. Pope John Paul II had been ill throughout 2005 and though his death was anticipated when it did come on April 2, it was still a jolt. And it was the whole world, not just the Catholic world, which appeared jolted by it. Surprisingly, British media outlets, normally no friends of the Catholic Church, were awash with praise for the late pontiff, the front cover of one left-leaning daily simply proclaiming: John Paul the Great. Perhaps, in hindsight, it shouldn’t have been so surprising; after all, greatness is greatness. On arrival I headed to St. Peter’s, where the lying-in-state was taking place, and joined the long, snaking queue that encircled the famous church. By now, it was 6 pm local time. The queue was long and moved slowly, very slowly; it was going to be a long wait. When you spend hours standing in a line, you become curious about the others who are doing so. In front were some young people, a school or youth group—perhaps understandably, at that age, interested only in each other. A couple stood next to me; we got talking. They too had heard the news and knew they had to come, all the way from Venezuela. My flight had taken a couple of hours from London. Their flights had taken much longer—almost a day’s journeying. Their desire to be there was moving, with the privations of the long wait seemingly of no account. Looking at them, I could only feel shame at my inward moaning about having to wait so long. Behind us there was another distinct group. While most of us queuing were dressed in a non-descript modern way, the group that joined directly behind were dressed formally. In fact, they were dressed in some form of uniform. They were Polish and I assumed that their distinctive garb was that of a guild or trade union. But it was not just their dress that set them apart. Whereas those all around chatted, and sat or flopped where they waited, this group was different. These workingmen stood erect, their eyes appearing never to move from the now illuminated white façade of St. Peters. This was not just a mark of respect, I decided, no, this was prayer. The largest crowd ever assembled in Europe up until that point, and in the midst of those two million people, what appeared to be a white spot in the distance. The strange thing was that even though the Pope was so distant, I still felt his presence. I remember little of what was said, I remember the weariness of the day, and later the coldness of the coming Roman night, but what I remember most was the sense of his being with us—connected in some way. Yet this was no “pop star,” but rather an increasingly frail old man, one who had touched the lives of millions of young people, some of whom were now all around me. Still, I wondered how many owed their faith to this man whom they could barely see in the distance; I knew for certain there was one stood there who did. Not knowing what to expect, I was unprepared for what I found. Thousands, ten of thousands, of young people marching to the Champs-Élysées: nuns in habits, monks barefoot walking through the Paris streets, singing pilgrims, their happy faces confronting those of bewildered Parisians. Flags of many nations waved as the Vicar of Christ walked the streets of a city where 200 years previously God had been banished in a bloody revolution. Now, a new revolution was just beginning. Press reports had been gloomy prior to the Pope’s visit. Even in London news had filtered through that the Pope, even this Pope, had badly miscalculated. No one in this now self-consciously secular republic would be going to see him. Even some of the French hierarchy feared an embarrassment for both the Church and the Pope. The crowds that flocked to see Pope John Paul proved the naysayers wrong. On the last day of this global meeting, I trudged to a racecourse on the outskirts of Paris. The earlier predictions had been that those expected would barely fill it. Quickly, I realised there had been a mistake, as the numbers of those arriving seemed to grow and grow and the space available got tighter and tighter. Soon we heard helicopters overhead and various French security forces started to appear. Later I was to learn that the army had to be called out, such were the numbers making their way to the racecourse. There were fears, real fears, that the many thousands there would exceed any number that could be safely accommodated. That night, as the crowds reached all the way back to the center of Paris, another helicopter was sighted, and upon its landing a figure in white emerged to rapturous cheering. At 6 am, as the sun slowly began to emerge against a Roman sky, I climbed the final steps to St. Peter’s before entering into its still silence. 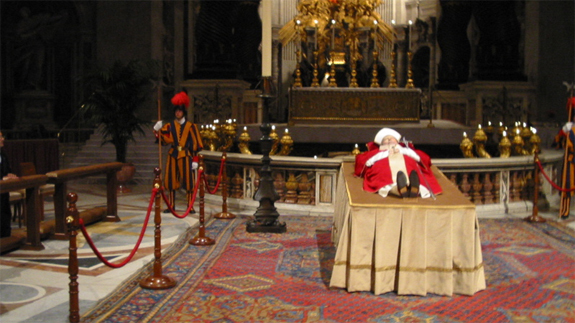 As I made my way down the central aisle I could see the coffin flanked by Swiss Guards. Moments later I gazed upon the face of the man who had changed my world. Now, strangely closer to him in death than ever in life, I knelt. Having paid my respects, I moved to the side as other mourners approached. Down the aisle came the Poles who had been with me throughout the night. They were eight or so in number, marching in formation, oblivious to all around, their eyes staring ahead to the coffin in front. When they came by its side, they stopped and bowed their heads in silence. Their eyes were now mostly closed, but one could still make out the marks of tears upon their cheeks. Then, heads again erect and once more in strict formation, they turned and marched out into the morning sunlight. The next day the funeral took place. I stood on a Roman side street, unable to get any nearer, and watched the broadcast beamed onto screens. I was surrounded by many nationalities, but unsurprisingly the Poles predominated. Throughout the Requiem they held their flags aloft—papal flags and those of Poland. When this Pope had been elected their nation and their religion was subjugated. It was due in no small part to this man that their land and their faith were once more free. Their flags were a testament—a nation and its faith had survived. When the coffin of the late Pontiff was carried from sight, it was then that the flags were lowered, and as they were, over the many thousands gathered, a hush descended, punctuated only by the sound of sobbing. Walking from St. Peter’s that day, I realized what a time of greatness I had lived through—a greatness that had touched my life and touches it still.